This suit backpack travels elegantly, keeping clothes crease-free and holding all your essentials. The outside has a semi-rigid circular design that minimizes wrinkles—that’s where your clothes go. Inside, there’s a waterproof utility bag for sneakers and toiletries, along with a designated laptop pocket. You and your clothes will arrive looking sharp. Dimensions: Rolled: 22" x 8.6" x 9.8"; Unrolled: 22" x 39.7"
There is a right way to pack a suit and Henty figured it out. Their suit and garment bags help you travel elegantly with crease-free clothes and all your essentials. The bags are designed with your business and activewear in mind. 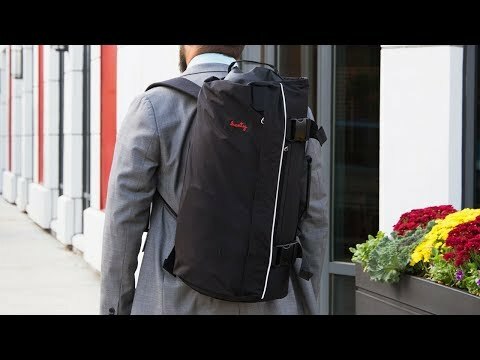 The outside houses your suits, while the inside has a waterproof utility bag for sneakers and toiletries, and a designated pocket for your laptop. A rain jacket for your bag is included too, so that no matter what, your belongings stay intact. 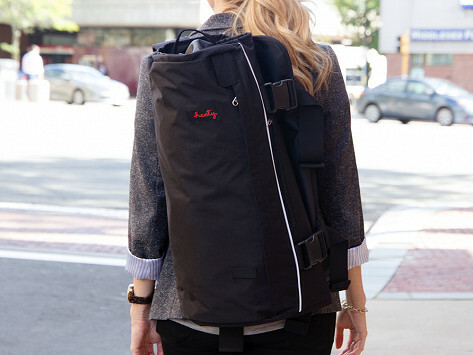 Henty carries two whole outfits, including suit jackets, pants, skirts, and up to three shirts. The key to making sure your clothes (and you) arrive looking sharp is in the semi-rigid vertical ribs that limit the bag’s diameter when you roll it, which minimizes the chance for creases. Whether you’re biking to work or embarking on a weekend trip, Henty is a comfortable, yet sophisticated way of transitioning from one activity to the next.